Lock with two Brass keys can be fitted in Swing handles and multiple locking system including building hardware. We are engaged in offering an alluring range of superb quality Brass Deadlock to our clients. Our range of product is perfect to fit on wooden doors and provides high security. Because of its optimum quality our products are highly demanded in domestic and as well as in international market. 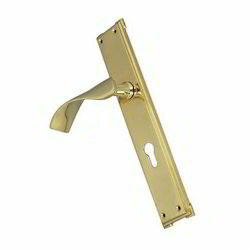 Clients can avail from us this range of Brass Deadlock at most affordable prices. Ambey Enterprises is a Manufacturer and Exporters of high quality Brass, Aluminum, Black Iron malleable and Steel Door Lever Handles, Door Knobs, Door Knockers, Gate Latches, Hinges, Letter Plates, Tower Bolts, Window Stays, Window Fasteners, Door Accessories, Handrail Fittings & Railing Brackets, Statutes, Fire fronts and Fireside Accessories. We manufacture and export Center Lock. Made from High Quality brass profile and solid casted brass and machined and fitted with accuracy for smooth and easy performance. 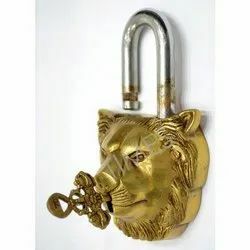 Manufacturers and Exportres of brass door locks. Our door locks match the best in terms of quality, elegance and finish. Customized designs and finishes are also available. The brass is known for its beauty and elegance since ages that's why to add the same elegance to your home, we bring door locks that are made of brass.